Sponsored by AB PIP STEM & Roche Bros of Acton. 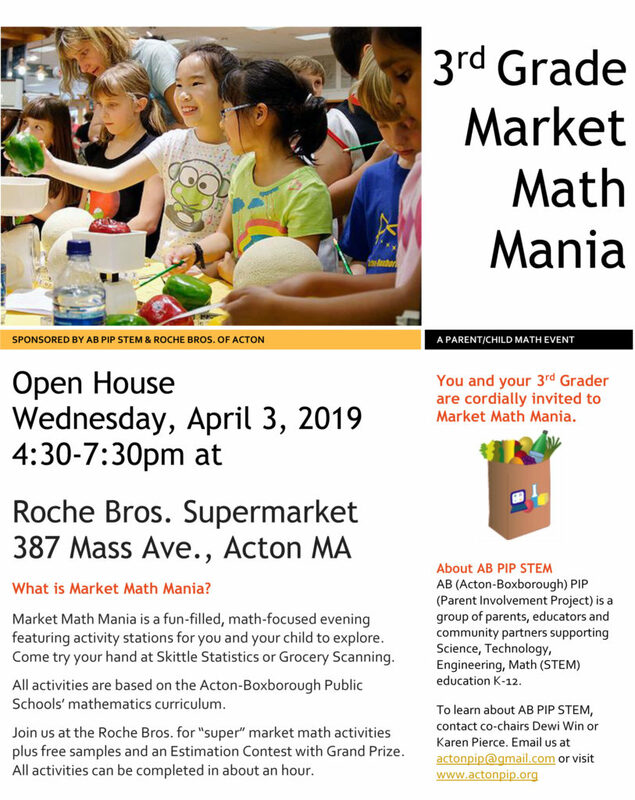 Open House Wednesday, April 3rd, 2019 4:30-7:30pm at Roche Bros. Supermarket. 387 Mass Ave.
What is Market Math Mania? It’s a fun-filled, math-focused evening featuring activity stations for you and your child to explore. Come try your hand at Skittle Statistics or Grocery Scanning. All activities are based on theActon-Boxborough Public Schools’ mathematics curriculum. Join us at the Roche Bros. for ‘super’ market math activities plus free samples and an Estimation Contest with Grand Prize. All activities can be completed in about an hour. Pan-Mass Challenge Kids Ride – Cyclists….on your marks!